The Government will end tenure review in the South Island high country, Land Information Minister Eugenie Sage announced today. Tenure review is a voluntary process where Crown pastoral land can be sold to a leaseholder and areas with high ecological and recreational value can be returned to full Crown ownership as conservation land. “Tenure review has resulted in parcels of land being added to the conservation estate, but it has also resulted in more intensive farming and subdivision on the 353,000 ha of land which has been freeholded. This contributed to major landscape change and loss of habitat for native plants and animals,” said Eugenie Sage. “Tenure review has produced a mixed bag and has been criticised for a long time. It’s not clear that the taxpayer has always got value for money. With tenure review ending, the remaining Crown pastoral lease properties, currently 171 covering 1.2 million ha of Crown pastoral land, will continue to be managed under the regulatory system for Crown pastoral lands. An announcement about the future of Crown pastoral land management will be made on Sunday. Ending tenure review will involve law changes to the Crown Pastoral Land Act 1998. That act was passed during a term of the Bolger/Shipley Government, and survived both the Clark term and the Key/English term. For all of its flaws, there was something comforting about the way tenure review united groups that are often in conflict. Before it was officially canned on Thursday, it was a rare piece of public policy that had few champions on any part of the political spectrum, despite the fact it had stuck to successive governments like a sloth clinging to a falling tree branch. There was little evidence of enthusiastic support, or even a vague notion of what was meant to be accomplished. That was certainly the conclusion of an internal review by Land Information New Zealand (LINZ), released last week, which appears to have sharpened the blade for tenure review’s execution. It was a fall from grace for a policy that had started with promise in the 1990s, when there was multi-partisan consensus between farmers, conservationists, and public access groups that it just might work. You could give farmers more control over managing the land, add to the conservation estate, and improve access to the most scenic parts of the country in one fell swoop. That vision, in practice, strayed so far from its origins that by the time it was formally dropped, it would be hard to find a less popular policy, particularly one that had been continued by four successive governments. Many farmers and conservationists had come to resent tenure review, albeit for different reasons; the minister responsible for LINZ, Eugenie Sage, had once called tenure review “the greatest wave of privatisation since Rogernomics” and repeatedly pointed out it had been “heavily criticised” when she announced its cancellation this week. "There's nothing good about it & there's everything bad about it…" Canterbury University environmental scientist Ann Brower tells @SusieFergusonNZ tenure review has carved up significant amounts of conservation land for things like dairy farming in the Mackenzie region. After the calm there’s storm, or at least a brief blast from the south. That’s over a 1.000 meters so not surprising to see snow there in southerly storms. The Desert Road in the North Island gets to about the same altitude so could get a dump as the storm goes north. That means the Northern Motorway is likely to be closed for a while, and the hill suburbs will have a late start this morning – Wakari is at 220 metres and Brockville 300 metres – my granddaughter will likely be having some fun today at home. But this looks fairly light and it is forecast to be brief, so winter life will go on as normal. The Alpine Fault is a big feature of South Island geography and seismic activity. It last ruptured in 1717 and there is a big earthquake, on average, about every 300 years, but the times vary so there is thought to be about a 30% risk of the next ‘Big One’ in the next fifty years. When I was woken up by an earthquake in the middle of the night on 4 September 2010 I wondered if it was ‘the big one’ – it was big enough but that was centred close to Christchurch. This image clearly shows the fault running up the West Coast, where the Australian plate dives under and drives up the Southern Alps which line along the rising edge of the Pacific Plate. 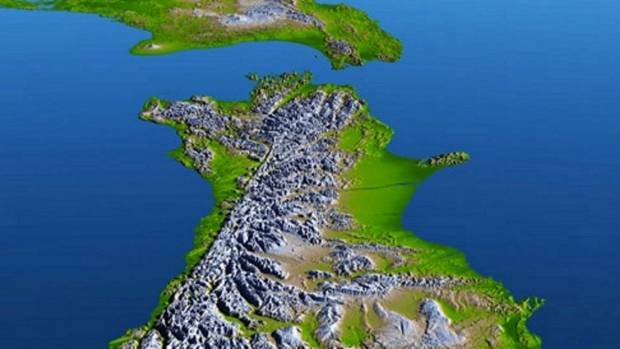 Video simulations demonstrate widespread destruction across the South Island if New Zealand’s most dangerous fault line ruptures, and there’s evidence the country is due for another big one. Project Alpine Fault Magnitude 8 (AF8) released a series of videos on Wednesday, warning there’s compelling geological evidence to show it produces a significant earthquake of magnitude eight or greater every 300 years on average. The last rupture was believed to have happened in 1717. That sounds dramatically imminent, but the intervals have actually varied between 140 and 510 years, so it may or may not happen in our lifetimes. The Stuff has the latest videos. Dunedin is about as far as you can get in the South Island from the fault but when the big one strikes it is certain to be felt here (we feel larger Fiordland earthquakes as well as the bigger Christchurch quakes) and it is likely to have major effects across the South Island, and also in the lower North Island. Zoomed in to show the Taieri Plain flooding (just to the left of ‘Dunedin’, with the sediment outflow at Taieri Mouth washing up the coast. I went down the coast to Taieri Mouth on Sunday, the river looked like a swollen sludge outflow. The surf right down the coastline was very dirty. The sediment from the Taieri River is drifting up the coast towards Dunedin.The Taieri River comes from the Maniototo where there was also heavy rain. The sediment outflow in the bottom right of the photo is from the Clutha River. There was also flooding upriver there. The International Space Station orbits at a mean altitude ranging of 330 (it needs periodic boosts to restore it’s altitude). More interesting pics of different parts of the planet from him here. Quakes have continued to rumble through the night in the north east of the South Island, with 28 recorded at Geonet in the last hour (4:20 to 5:20 am). There have been about 800 aftershocks altogether. There are reports that there could be up to 100,000 landslides/slips. What we are finding in New Zealand is that quite a few of our larger earthquakes involve jumping from rupture on one plane to another in a complex sequence. So both Kaikoura and Seddon continuing to bear the brunt of this. Those are moderate sized quakes on the scale but they are shallow (8-25 km) so more energy gets to the surface than deeper quakes. This map shows the pattern of quakes since midnight yesterday. Most of them are shallow. That shows the clustering in North Canterbury-Marlborough with a couple in Wellington but they feel the bigger Seddon quakes in Wellington too. In the simplest case an earthquake is a rupture on a single fault plane. What we are finding in New Zealand is that quite a few of our larger earthquakes involve jumping from rupture on one plane to another in a complex sequence. We first saw that with the Darfield Sept 2010 EQ where multiple segments ruptured together as a single earthquake. We appear to have seen this again overnight. In terms of what might happen next: The scenarios provide an overview of how we see this earthquake sequence evolving over the next few days to one month. What is on the web page is our best information that we have to hand at the moment. We’ve developed three scenarios based on what we know so far but be aware that our understanding is evolving as we do more analysis and receive more data. A normal aftershock sequence that is spread over the next few months to years. Felt aftershocks (e.g. M>5) would occur from the M7.5 epicentre near Culverden, right up along the Kaikoura coastline to Cape Campbell over the next few months to years. This is the most likely scenario. In the next month, it would be likely that rupture of earthquakes of about an M6 in the North Canterbury and Marlborough regions will occur, as well as potentially offshore in Southern Cook Strait and offshore Kaikoura. The least likely scenario is that in the next month, (it is unlikely but still possible) there would be rupture of longer known faults (with earthquakes of about M7), in the Marlborough and Cook Strait regions. So there is at least likely to be a continuation of the many aftershocks, with the lower possibility of some quite large ones still to come. I haven’t watched television news for over a week until getting home today. I’ve watched the headlines on both Prime and 3 News. Apparently one of the big news story’s of the day is there is some snow on a mountain skifield. They both showed Coronet Peak without saying if this extraordinary phenomenon had occurred on other mountains or not. It did – I saw quite a few snow capped ranges this afternoon as we flew across the South Island. I’d say the snow line is above 1,000 metres so it’s still confined to the tops of the hills. Sure there’s a bit of a nip in the air – we landed to 4 degrees – but that’s not particularly unusual in a southerly change here. The forecast is for snow tonight – what will they put on the news if there’s actually snow at altitudes that people live? It just seems a bit desperate to go up to a ski field to find some snow for a weather story.